I was reading Santosh Sir’s article on application controller pattern last night. Those who have some understanding on J2EE design pattern know the different between Front Controller and Application controller pattern. Struts 1.x is a best example of both. You can read the Santosh Sir’s article on Front Controller and Application controller pattern. So Today I have decided to implement application controller design pattern which can use java’s properties file to read and configure controllers. View.java is a wrapper view resolver return from Controller’s execute method. ControllerConfig is used to hold controller’s action with it’s class name. WebConfig is used to manage all controller configured in properties file. This class will read, and make available all controller Object to Main Servlet. System.err.println("Not a Mapping file or not exist.."
format("Action %s is already exist. " 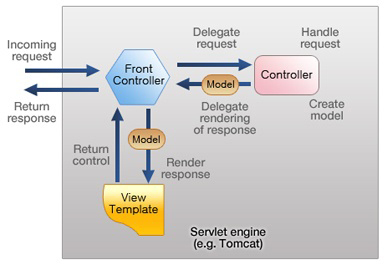 And Last is our Front Controller servlet (AqsaServlet). Aqsa Servlet is a Centralized control in application, a sigle entry point which manage Protocol Handling, Request Navigation and View Dispatching.